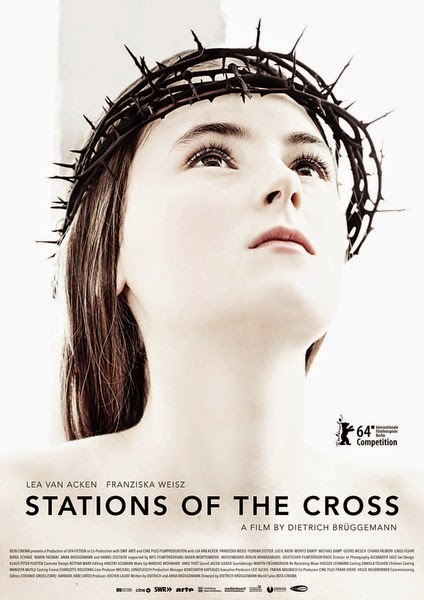 Dietrich Bruggemann’s ambitious, challenging, rigorous Stations of the Cross is 107 minutes and only 14 shots long. You do the math. Actually, I’ll do the math: that’s more than 7 and a half minutes per shot. And if you are versed in Catholic trivia, you can readily guess that each shot will be structured around one of the events that chronicles Christ’s carrying of his own cross towards his crucifixion at Calvary. Knowing this is a slow, German religious-themed film is either going to make you run away screaming or play on your curiosity. The story is focused on a devout teenage girl named Maria (Lea van Acken giving one of the year’s best performances), who struggles with her ultra-strict mother and ultra-traditional faith. Preparing for Confirmation, her priest warns about such evils as non-ecclesiastical music, looking in mirrors and eating cookies. At home she takes care of her brother, who is mute and possibly autistic, and frequently clashes with her mother over chores, responsibility and the purity of her motives. Things get worse when she meets a boy at the library who invites her to his choir, at a church that allows ‘the devil’s rhythms,’ and Maria lies to her mother while trying to get permission to attend. One of the many things to Bruggemann’s credit is that each shot is different and engaging, even for the conspicuous lengths of time they are held. The compositions are obviously very strong (they better be! ), but his blocking and attention to expression and delivery are also exquisite. Stations of the Cross is never patronizing, never lazy and never wastes your time. It has a fresh, intense immediacy and a deep respect for its characters, who in a lesser work would be quickly reduced to symbols. Instead, the parallels to the actual Stations of the Cross (which are displayed onscreen before each shot), range from subtle to seemingly incidental and several are largely open to interpretation. For example, ‘Jesus is stripped of his clothes’ is a hospital visit in which Maria has to take off her shirt for the doctor to examine her. Though that isn’t the main point of the scene, it hints at feelings of vulnerability, exposure, shame, defeat, secular practice railroading spiritual qualms, etc. I actually misremembered my long-since-lapsed childhood rearing and thought the twelfth shot, the powerful climax, was the last. When the movie continued I had my doubts there was anything left to be said. I was wrong.